Time for dinner, Sam. You must be hungry. Open wide for the airplane. Pay attention, Sam. There's a lot of good food on board. Two frustrated parents try their best to get their son, Sam, to eat his dinner. I'm not sure which parent has the "easy" role in this one: Mom with the spoon, or Dad with his crazy antics. Sam is not impressed enough, I suppose, by Dad's antics to open wide enough for Mom to slip in the spoon. Will the two give up? Should the two give up? Will Sam's dinner go into Sam? Who's that behind the bush? It's a friendly lion! Roar! Roar! Who's that in the treetops? It's a tall giraffe! Munch! Munch! Does your little one love to make animal sounds? 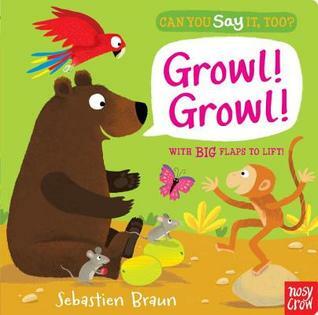 Does your little one love to lift flaps in books? Then this new series in the Nosy Crow line might be a good match. The books are simple, very simple. There are only a few words per page making this one a good choice for little listeners with short attention spans. It can also be an interactive experience if you encourage your little one to join in on making all the sounds. I will say that this probably isn't the best in the series for actual animal sounds. The animals featured are lion (great choice), giraffe, hippo, crocodile, and elephant (great choice). Earlier in the year, I reviewed two books in this series. Can You Say It Too? Moo! Moo! And Can You Say It Too? Woof! Woof! Who's that behind the rock? A hungry bear! Growl! Growl! Who's that among the flowers? It's a pretty parrot! Squawk! Squawk! This is the fourth book in Nosy Crows' Can You Say It, Too? series. This series is great for little ones who love animal sounds. Also there is a big (seemingly sturdy) flap to lift for each page. All the animals are hiding, of course! Which animals can little ones find in this book? A bear! A parrot! A snake! A monkey! A tiger. You can guess based on this selection, that reading it aloud will be a treat. Plenty of opportunities to get loud and play! 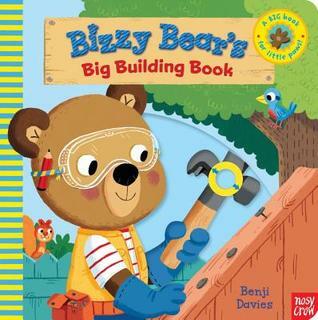 Bizzy Bear has an exciting building project to do today! First he makes sure he has all the tools he needs. Then he gets started with some measuring. Bizzy Bear and three of his friends, Eric, Rosie, and Freddy, are all busy building something. When the project is finished, they'll all be able to enjoy it. But building can be fun too. This one is an interactive book for little ones. Little ones can measure with the tape measure. They can saw wood. They can use a drill. They can paint. The book itself seems sturdy. There are a few flaps--some of the smaller flaps--that seem a little less durable than the rest. But for the most part, I think this one was designed to be played with by the target audience.